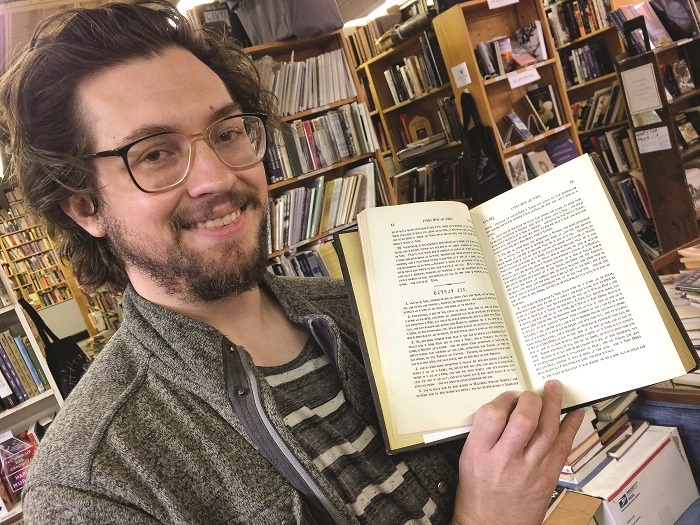 Cameron, of Ken Sanders Rare Books, holds a rare copy of the Book of Mormon translated into the Deseret Alphabet. Photos by Alyssa Bray. “The advantages of this alphabet will soon be realized, especially by foreigners … It will also be very advantageous to our children. It will be the means of introducing uniformity in our orthography, and the years that are now required to learn to read and spell can be devoted to other studies.” ~Brigham Young, delivered in the Salt Lake City Tabernacle on October 8th, 1868. Learning to read and write the English language is understandably difficult. The potential confusion in knowing the write way to right and spell many English words is due, in part, to homonyms, homophones, homographs, and heteronyms; words with different meanings that sound the same—with the same or different spellings, words that sound the same with different spellings, words that are spelled the same with different meanings, and words that are spelled the same, have different meanings, but are pronounced differently, respectively. Between the years 1847 and 1854, Brigham Young, Utah Territory’s first governor and the second president of the Church of Jesus Christ of Latter Day Saints, headed a group of men, including Parley P. Pratt, Heber C. Kimball, and George D. Watt, in an attempt at streamlining literacy through spelling reform. Their motivation was to simplify communication, especially as more settlers of Mormon country were coming from overseas and trying to learn English as a secondary language. It was thought that a reformed alphabet would increase literacy rates, eliminate spelling inconsistencies, be more efficient to read and write, and erase the differences in social class by unifying the common speech. The result was a strange set of 38 characters to be known as the Deseret Alphabet. These days, the idea of alphabet reform seems silly and pointless, but in the mid-nineteenth century, this idea was forward thinking and progressive. By the mid 1800s, there were as many as 50 separate attempts at spelling reform. In 1837, Sir Isaac Pitman first published his own system of phonography, which became known as Pitman Shorthand, and was, for a time, the most widely used form of shorthand in the English-speaking world. Pitman’s system was almost adopted for primary use by Brigham Young’s panel. Ultimately, the decision was made to create an entirely unique alphabet. Brigham Young’s Deseret Alphabet is a phonemic system, meaning that one spoken sound is represented by only one written symbol. Using the Deseret Alphabet Translator (which can be found at www.2deseret.com), the homonyms, eight and ate, would be simplified in spelling to ??. The Deseret Alphabet enjoyed a relatively small heyday. The new alphabet was taught in a few schools, Deseret characters were used on occasional shop signage, and the phrase “Holiness to the Lord” was printed in Deseret Alphabet on a gold coin dated 1860. Despite some adoption and use, the experiment of the Deseret Alphabet resulted in failure, due largely to the fact that the introduction and teaching of the Deseret Alphabet was begun before any reading materials were available in printed form. Because the characters of this new alphabet were unique, an entirely new font needed to be created. During the process, a number of differing opinions meant that coming to an agreement about the final style and formalization of the font proved difficult. In 1857, a metal typeset was commissioned out of a St. Louis foundry, but the project was delayed due to the Utah War. In 1859, The Deseret News started printing articles using the new alphabet and eventually two school primers were finally printed in 1868. Unfortunately, by the time print materials were finally available, public enthusiasm was already in decline. The effort put toward the ability to print materials using the Deseret Alphabet had already cost the LDS church $20,000. It was estimated by Parley P. Pratt, that the cost of supplying the schoolchildren within the Utah Territory with primers would reach upwards of $5,000,000. Spelling reform by the Mormons had now become cost prohibitive. The intentions behind the creation of the Deseret Alphabet were sound, but in practicality, the alphabet was an expensive failure. The creation, promotion, and execution of adopting the Deseret Alphabet within the early Mormon community may not be all for naught. 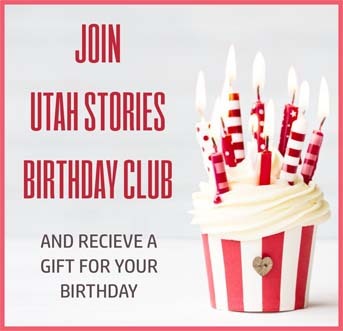 Today, there is a growing community interested in Utah and Mormon history and culture. Deseret Alphabet fonts are available for download. 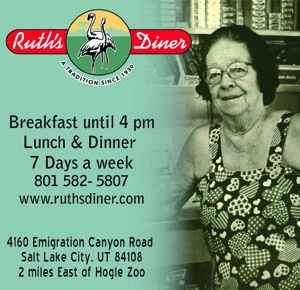 Deseret characters have been included in the works of contemporary artists. In 2013, an edition of Alice’s Adventures in Wonderland was printed using the Deseret Alphabet. Original materials printed with the Deseret Alphabet do still exist, but they can be hard to come by, and for collectors, can come with a hefty price tag. It took more than 150 years, but the Deseret Alphabet has experienced a small revival and it surely deserves to be remembered as a unique piece of Utah’s past. 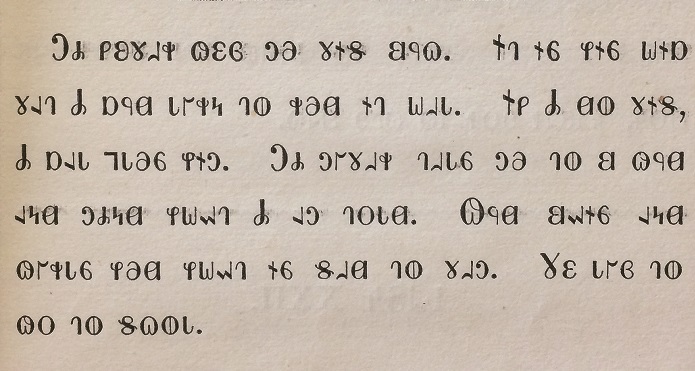 Sample from the First Deseret Alphabet Reader, printed in 1868.